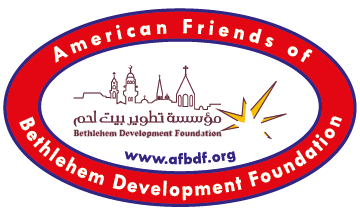 On May 2016, Bethlehem Development Foundation, Beit Sahour Municipality, and the Arab Orthodox Society celebrated the opening of Muallem Said Khoury Sports Complex in Beit Sahour. The project was funded by the Khoury family in memory of the late Muallem Said Khoury. Beit Sahour Municipality and Bethlehem Foundation wanted to provide the residents of Bethlehem area with sports facilities according to international standards. The project involved the completion of unfinished works including parquet flooring and sound attenuation to the indoor basketball court and the external landscaping and parking areas. A delegation representing BDF and CCC attended the Inauguration of Muallem Said Khoury Sports Complex. Namely, Mr. Samer Said Khoury, Board of Trustees Chairman/President of Engineering and Construction at Consolidated Contractors Company (CCC), and Mr. Suheil Hassib Sabbagh, President of Human Resources at CCC, Mr. Ziad Al-Bandak, Chairman of Board of Directors, Mr. Nafez Husseini, Secretary of the BDF Board of Directors and VP at CCC, Mr. Mazen Karam, Managing Director/CEO, BDF and CCC Palestine staff. The late Mr. Said Khoury, Co-founder of CCC and founder of BDF has pledged to rehabilitate and beautify Manger Square. Objectives and Rationale Manger Square is the iconic center of Bethlehem, and the hub of various religious activities and festivals celebrating the birth of Jesus Christ. As well as national and social celebrations. Planning and \beautification of Manger Square aims at reclaiming the functionality of the square as an open space and its status as an urban landmark free of vehicular traffic. It will help in prolonging tourist stay in Bethlehem, job creation and the overall quality of life. Project Phase-1 KNT Construction Company executed works at the three municipal buildings surrounding Manger Square. At the old municipality building the roof water distribution system was rearranged for optimal use and minimal load. The sixty year old waterproofing was replaced, the front facade windows were enlarged while all other windows were replaced and all the outside stone facades were cleaned and repointed. At the new municipality building all facades were cleaned by water jetting and sand blasting and the roof was cleaned up. Similarly, the Peace Center facades were cleaned by water jetting and sand plastering. The roof was cleaned and the main façade doors and windows repaired and repainted. Project Phase-2 Works were executed by Al-Maher General Contracting Company and included: The Square Improvements: The Square improvements included various landscaping interventions including patching of damaged tiles, cleaning of stone elements, adding new signage to shops and installing two digital screens. The main entrance to the Municipality was changed by replacing the existing short wall with a planter, adding flag poles, fixing street tiling and drainage and streamlining traffic with fixed bollards and moveable planters and creating a new parking for the Mayor away from the entrance Afteem’s Road is an essential exit of the square, the surface was tiled and the road had no drainage system, our intervention included asphalt with a rough texture to avoid a slippery surface, adding a drainage system to the road, and adding a new stair case for pedestrians. Solid Waste Management (SWM) was a challenging issue facing Bethlehem Governorate. It contributed to many pollution problems in spite of gradual improvement. There are some serious shortfalls in SWM in which are potentially causing a significant impact on the environment and public health. Wide improvements were urgently needed to the solid waste management system. The project consisted of two components: The first was the preparation of a solid waste master plan for serving the Bethlehem Governorate up to 2034. Focus group discussions, surveys for household residents’ and SWM program operators, on-site waste characterizations and field investigations, were conducted. Per capita waste generation rates varied between different localities with a mean value of 0.74 kg /person/day. Average percentage of waste was organic (40.9% by weight), suggesting a strong resource recovery potential in terms of animal feed or compost. Recyclable waste (plastic, paper and card, glass and metals) made up 40% by weight of the waste composition suggesting an incentive to introduce source separation. Most localities (91.4%) in Bethlehem Governorate have a solid waste collection service. Different options for improving the efficiency of the existing SW routing system in Bethlehem have been studied, and the optimum one has been recommended. The core change to waste collection is a proposed new system to be implemented in 18 waste catchment areas. Efficient routing of solid waste collection vehicles has been designed which will decrease costs by reducing the distances to be travelled, laborers expended for collection and the number of collection vehicles. Forty eight dumping sites have been surveyed in Bethlehem governorate and detailed recommendations for their rehabilitation and control have been presented a detailed financial analysis of two scenarios to have a transfer station (TS) or not in Bethlehem governorate has been investigated. The analysis shows that the mean direct and in-direct operating costs for the collection and transporting of one ton from Bethlehem governorate to Al Menya landfill with a Transfer station will be at a higher cost. So, the final decision was not to establish a TS, and re-evaluating the need for it every 5 years. The Master Plan recommended that the solid waste collection system for Bethlehem governorate should include construction and demolition waste in addition to the planning and construction of a sanitary landfill for these wastes. In order to reach a sustainable situation of SWM at Bethlehem governorate, different issues should be enhanced such as expertise, funding, public awareness and facilities and equipment that are currently lacking or inappropriate. SW recycling should be considered as an important option and a priority to reduce degradation of the environment. The second component involved the procurement of solid waste containers, waste collection equipment and building of a central maintenance station. Comprehensive surveys in Bethlehem localities exposed the real needs of the different types of containers which includes steel and plastic waste containers, wooden dust bins for touristic areas, steel mesh basket containers for solid cardboard waste separation at source, plastic containers for butchers’ waste separation at source and plastic container for compost at household level. Solid Waste Containers was awarded to Al Marah Company for Industry and Trading with a Total Price of $400,234. Surveys also exposed the need for the procurement of solid waste vehicles including compactors, large street sweeper trucks, mini street sweepers, a skid steer loader, a mini-tipper truck, a roll-on-roll off truck and a vacuum cleaner for street litter. The bulk of the heavy equipped was supplied by Al Assbah Company for Heavy Equipment (VOLVO). Other suppliers included BOW Equipment Co, Palestinian Tractor & Equipment Co (CATERPILLAR), Lot 3 The surveys found that the Joint Services Council for Solid Waste Management is in dire need of a central maintenance workshop, fully equipped with tools and machinery. The Construction of the Central Maintenance Station and Administration building was constructed by Al Helo Contracting. A public awareness campaign has been implemented during this Project. Four central workshops under the title “Towards a clean and beautiful environment in Bethlehem” that targeted related groups and individuals in Bethlehem governorate have been conducted. Workshops evaluation ranged from excellent to very good. At the end of the project, also 10 theatrical awareness plays were made in schools targeting all malpractices and encouraging good practices conducted by Al-Hara Theatre in cooperation with Al-Asbah Company – Volvo Dealer.